Red Gate Farms offers a first-class horseback riding lesson program tailored to the individual. Whether you are a seasoned rider or an absolute novice, we have the right horse for you! Enjoy learning the basics or the finer points of Western Horseback Riding, Horsemanship, Horse Training or General Care. We offer Private, Semi-Private and Group Lessons. 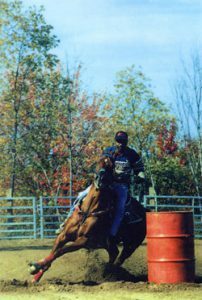 We also offer Barrel Racing and Speed Games Lessons and participation in friendly competition in our family riding club. And remember, riding lessons aren’t just for the younger members of the family anymore. Our students range from 6 to 60. Yes, we offer adult classes, as well. More and more parents (and even grandparents) are finding the joy, peace and simple exercise found in riding horses. They can join their children on Trail Rides or even on ride days. Good fun, great family times. Come check out what you have been missing. Customized programs, parties and special events available. Call us at 845-386-5001 or email us for details and to schedule. Check out lessons are also available.